The function of a paragraph is that it contains one idea. At the same time it is newspaper practice to have a full line at the top of a leg. It does look odd to have a short line, as you often have at the end of a paragraph. Here the person responsible for the appearance of the page has taken the easy way out and simply run two paragraphs together. So you have a paragraph about both rats and the castaway, and it grates. In my view the words should take precedence, and you need to find a different way to do it. This might involve cutting a few words somewhere to change where the end of the paragraph falls. A suitable cut here would have been ‘secure’ from the first full par shown, since a haven by definition is a safe or secure place. You could also take out ‘after a survey of the islands’. Or you could change the size of the picture, in this case the map. It is a pretty pathetic map anyway since you would need a magnifying glass to see where the Shiant Isles are. Incidentally, ‘castaway’ is a noun, not an adjective, so ‘castaway woman’ is strange. 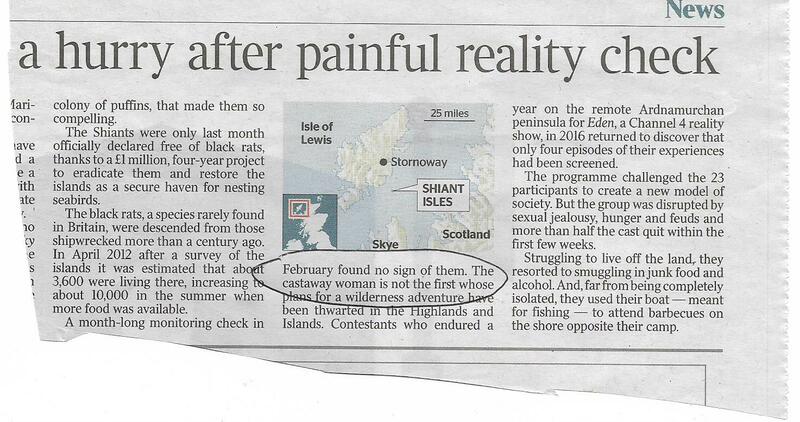 You could say ‘the female castaway’ or just ‘the castaway’.